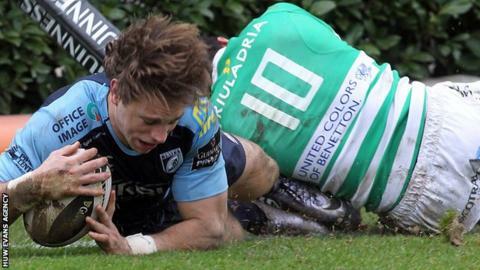 Jayden Hayward helped Benetton Treviso to their first Pro12 win this season as the bottom club shocked Cardiff Blues. The New Zealander scored eight points as the Italians enjoyed their first victory for a year - and that was against the Blues in February 2015. Blaine Scully had scored in the corner to give the Blues a half-time lead after two Treviso penalties by Hayward. But the hosts won it with a penalty try as Blues were penalised for pulling down a scrum just after half-time. The Blues' second defeat in Italy this season - following their loss at Zebre in October - ended their four-match winning run in the Pro12. Treviso, meanwhile, celebrated their first win in 14 games this season with a commanding display against a Welsh side without a host of their international players. After two early Hayward penalties, the visitors' United States international Scully gave the visitors hope of a fifth win in a row. The American skipper broke through on the overlap to score, but a second-half Treviso penalty try earned the Italians a first victory following 20 successive defeats. Blues number eight Manoa Vosawai had two good chances to score, but the defeat leaves Danny Wilson's side ninth and 16 points off the play-off places. Cardiff Blues: Rhys Patchell; Blaine Scully, Cory Allen, Rey Lee-Lo, Dan Fish; Jarrod Evans (Aled Summerhill, 61), Tavis Knoyle (Tomos Williams, 53); Thomas Davies (Bradley Thyer, 65), Kristian Dacey (Ethan Lewis, 65), Salesi Ma'afu (Taufa'ao Filise, 49); Jarrad Hoeata (Lou Reed, 65), James Down; Josh Navidi (Macauley Cook, 73), Ellis Jenkins (c), Manoa Vosawai. Benetton Rugby: Jayden Hayward; Ludovico Nitoglia, Luca Morisi, Alberto Sgarbi (c), Tommaso Iannone; Sam Christie, Alberto Lucchese; Dean Budd, Marco Lazzaroni, Andrea De Marchi; Tom Palmer, Filo Paulo; Simone Ferrari, Luca Bigi, Alberto De Marchi. Replacements: Federico Zani, Matteo Muccignat, Filippo Filippetto, Jeff Montauriol, Marco Barbini, Chris Smylie, Enrico Bacchin, Angelo Esposito.